The story of British South American Airways began with five shipping companies, the Pacific Steam Navigation Company, Royal Mail Steam Packet Company, Lamport & Holt Line, The Booth Steamship Company and the Blue Star Line. A committee was set up in November 1937 under the chairmanship of Lord Cadman to look into the state of British civil aviation. Its report was published on 8 February 1938 making several recommendations and resulting in the formation of British Overseas Airways Corporation in June 1939. Cadman had also noted that there was no British airline flying to South America and proposed that this omission should be rectified as soon as possible. The war had made the prospects of many shipping companies seem bleak. So many of their ships had been requisitioned and sunk that it was unlikely that they would ever be able to operate as they once had and, if they were to remain profitable, they had to find ways to diversify. Realizing that air transport would offer strong competition, the directors of the five shipping companies decided to explore the possibilities of starting their own airline to cover the routes they knew well, between Britain and South America. Although the shipping companies were unable to do very much during the war, by 1944 there was hope that the tide was turning for the Allies and so, on 25 January 1944 British Latin American Air Lines Ltd. (BLAA) was formed. Its first office was borrowed from the Royal Mail Lines and its chairman was John Booth. The directors were C. C. Barber, S. W. Black, W. H. Davies, L. Dewey and F. H. Lowe and before the war was over the airline had established itself at 14, Leadenhall Street, London E.C.3. A government White Paper published in March 1945 recognized some of the proposals outlined in the Cadman report. It set out policy for three main British airlines with clearly defined routes. The first was to operate on what was called the Commonwealth air routes, serving nations such as Kenya, Uganda , South Africa, India, Ceylon , Australia, New Zealand and Canada, as well as the USA, the Far East and China. The second would serve the capitals and major cities of Europe and internal British destinations and the third would operate to South America. It also recommended that the company formed by the shipping lines should be assigned the routes to South America. When the war in Europe ended on 8 May 1945 the directors of British Latin American Air Lines began work in earnest to develop the airline. After much discussion it was decided in September 1945 that BLAA would become British South American Airways Limited and with the change of name came a change of premises when, on 3rd, BSAA moved to their new offices at 19 Grafton Street, London, W1. Routes between the United Kingdom and other Commonwealth countries, the United States and the Far East (the existing BOAC). Routes between the United Kingdom and the Continent and internal routes in the United Kingdom. Routes between the United Kingdom and South America. 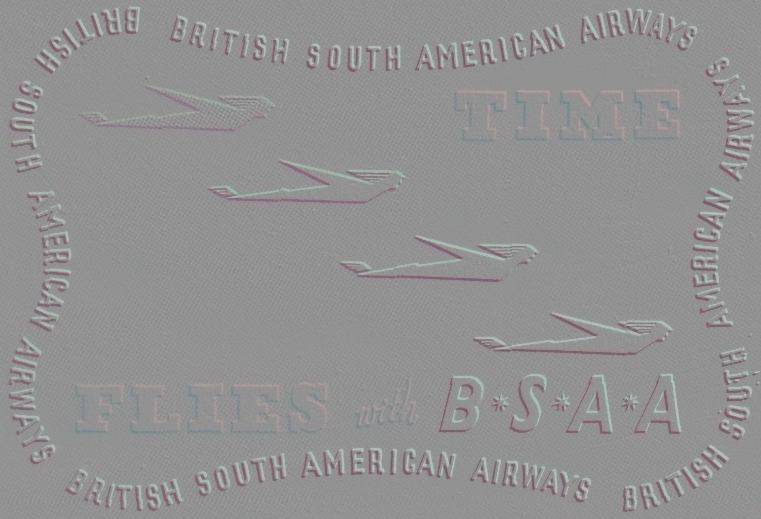 And so, after nearly a year of discussions, anxiety and fears that BOAC would succeed in its efforts to stop BSAA from operating on its chosen routes, it received the news, for the second time, that it was to be the Government's choice to fly to South America, as British South American Airways Corporation.